For some reason, the whole idea of Nazi zombies just doesn't get old. It was used to great -- and some times comedic -- effect in two Dead Snow movies. And now J.J. Abrams is bringing the scares and gore in the upcoming period horror flick Overlord. Overlord, for the record, was the code name for the D-Day invasion of Normandy by Allied troops in World War 2. Just so you get the reference here. Directed by Julius Avery, Overlord follows a team of paratroopers who are shot down over Nazi occupied France. As if that isn't bad enough, they have to contend with a group of Nazi-zombie super soldiers when they seek refuge. 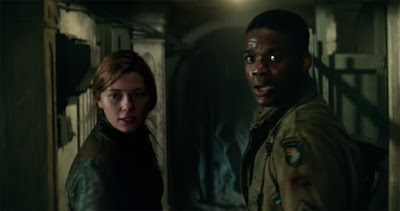 Overlord opens Nov. 9. And yes, the son of Kurt Russell is in this, in case you are wondering why one of the paratroopers looks so dang familiar.